Sockeye Homes’ President, Tod Sakai (pronounced “Sockeye”) who holds NAHB Certified Graduate Builder & Remodeler designations along with being one of a select few Washington State Certified Builders, developed his building expertise from the early 1990’s when he began his career in the building industry working for a general contractor that built custom homes internationally. Tod established a patented system for the company where he built a network of 43 home-building franchisees completing 1,500+ homes before founding Sockeye Homes in 2007. See a listing of awards won by Sockeye Homes. Award-Winning Custom Home Builder and Remodeler. 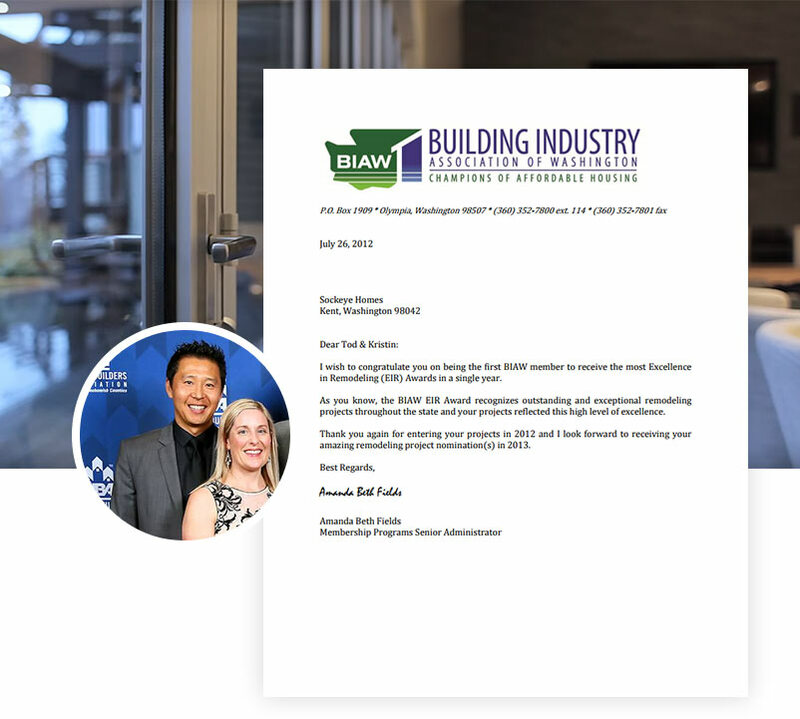 In 2012, The Building Industry Association of Washington (BIAW) congratulated Sockeye Homes on receiving 9 state-wide Excellence in Remodeling Awards in a single year. Sockeye Homes is the first company since the 1990 inception of the state competition to set this incredible record. To date, Sockeye Homes has received 107 awards with 21 of which are at the nation-wide level. In recognition of his business success, Tod received the Emerging Trader of the Year Award from Governor Locke in 2003. Master Builders Association of King and Snohomish Counties presented Tod the Remodeler Member of the Year Award in 2014, and following the achievement, he was elected to take the helm as Chairman of the BIAW Remodelers Council in 2017, where he also received the Washington State Remodeler of the Year award. Tod received the Export Achievement Certificate from the United States Department of Commerce for developing an international revenue source for an American company. Tod is often called upon to share his expertise with the broader community through keynote speaker and guest lecture presentations for the State of Washington Office of Trade and Economic Development, World Trade Club, University of Washington CINTRAFOR, King County Office of Business Relations and Economic Development, Tacoma Community College International Business Program, Northwest Real Investor Association, Japan External Trade Organization, and Japan Ministry of Construction. Tod served the Master Builders Association of King and Snohomish Counties as its chairman of the Remodeler’s Council. Tod is a graduate of Western Washington University and loves playing baseball, golf and riding his Yeti mountain bike. He is active in various Christian ministries with his family such as Vine Maple Place, Habitat For Humanity and UMC Youth Groups. Tod and his wife Kristin received the Department of Corrections Volunteer Award in 2007 from Governor Gregoire for their service in Rebuilding Families Inc. where Tod, Kristin and other volunteers connected inmates with their loved ones while providing education, funds and housing arrangements prior to their release.